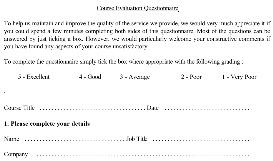 Use to provide hard-copy evaluation forms to attendees of training sessions to obtain their feedback. Multiple tickboxes make the form very easy to complete. Sufficient room for attendess to complete their own comments where necessary. Multiple categories of feedback can be obtained. A simple 1-5 scoring system is used.